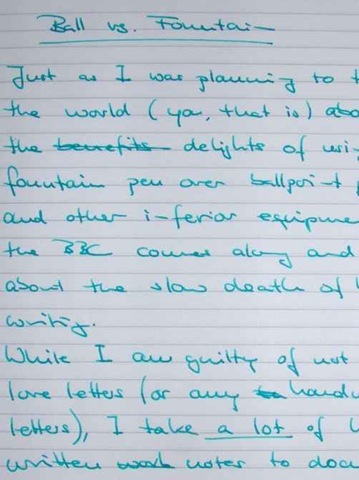 Just as I was planning to tell the world (you, that is) about the benefits of fountain pens over ballpoint pens or similarly inferior equipment, the BBC comes along and paves the way by commenting on the slow death of handwriting. While I am guilty of not writing handwritten letters, I take a lot of handwritten notes, mostly to document my work. I find that I am more thoughtful and more focussed when writing by hand as opposed to taking similar notes on the keyboard, and inserting a little diagram, or some-such, doesn’t have any overhead at all. If you have fallen out of the habit of handwritten notes, or letters, I recommend you try it out once more. Unfortunately, the BBC didn’t tell you how you should be taking your notes. This is where I come in and tell you that you should get yourself a nice fountain pen. Not one of the cheap and scratchy things we had a school, but a real fountain pen. Some mid-priced Waterman does the job nicely, but lots of other brands exist: Parker, Lamy, Cartier, Pelikan, Rotring, you name it. I am sure there’s a lovely fountain pen out there, just waiting for you. I do of course recommend Waterman. Nice shape and size, excellent tips, and in particular because they supply their lovely South Sea Blue ink, which you can also see in today’s little picture. This entry was posted in Thoughts and tagged pen, writing by w7. Bookmark the permalink.